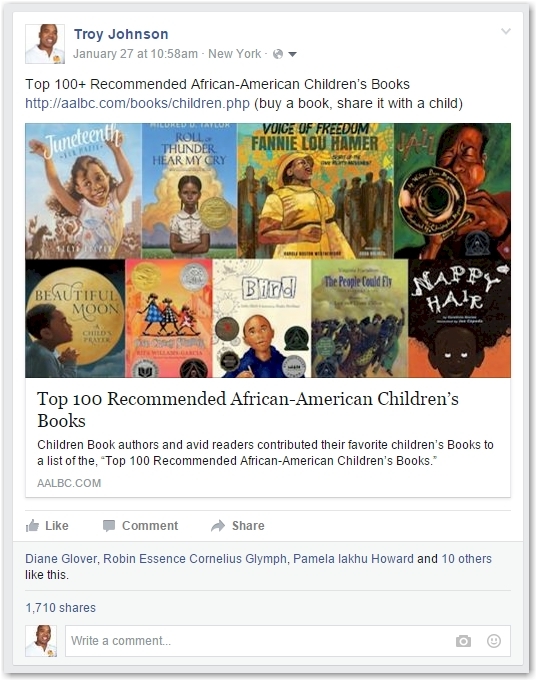 Back on the 23rd of January I shared a link to a page on my test site called, "100 Top Recommended African-American Children's Books." This is list really part of an overall strategy to increase my focus on children's books. At the time there were 70 something titles on the list; I was interested in getting more feedback on the page's layout as well as suggestions from others on additional titles. I posted a link on Facebook and it was shared over 1,700 times. The posts were also shared on Twitter, Google+, and Pinterest. These are the 4 social media platforms that I regularly post to. The reaction on Twitter was just as strong. I notice one site customized and created a post about the list, and gave complete credit to AALBC.com with clear hyperlinks back to this site--a very unusual, but positive action. Each day, over the two day period shown, there were more than 3,000 new visitors to the AALBC.com test site. Prior to this the website was getting 300 hundred visitors a day. This was all direct traffic. While the site was in the Google's index it was not getting any traffic from search. Because virtually all of the traffic to the site was due to this post, this gave me a rare opportunity to examine, in detail, how well social media performs in terms of generating traffic back to my web site and even in generating book sales. 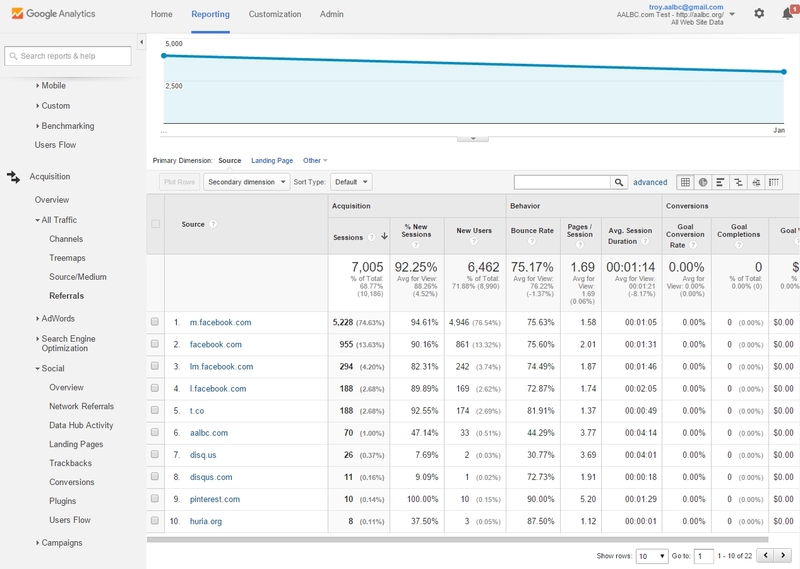 The Google Analytics screenshot below reflects the sources of traffic on my test site. You can see that 95% of the traffic to the test site came from Facebook and less that 3% from Twitter. I immediately consolidated the test site into AALBC.com proper, something I did not plan to do until the spring, but I was concerned about AALBC.org, creating confusion not just to users but to Google's Search engine. After migrating the test site to AALBC.com (a NON-TRIVIAL acitivity I assuure you), I reshared the chidlrens book list. The activity on the Twitter side continued even more strongly Below is just a sample of the updates I would get from Twitter on folks who shared or retweeted the page. My kid texted me from her job saying that she got a message from Twitter telling her that the post was trending. She also warned me that the link was wrong; it said aalbc.org instead of aalbc.com. I explained to her that it was not a problem (the non-trivial task was worth it). The link has been circulating on social media for about three weeks now. I can see the half-life is about a week. In other words the traffic generated to AALBC.com from all of social media for this post descreased approximately by half each week. The graph chart below shows the traffic from all of social media to the "100 Top Recommended African-American Children's Books" page from Jan 23 to the morning of February 12. As you can see there were a total of 18,851 visitors to the website--virtually all of them came from Facebook. The tremendous about of engagement on Twitter did not translate into very many visits. All of the engagement on Twitter benefited Twitter more than it did this site. This is not news to me as I've written a great deal about "likes" and "shares" not translating into traffic. But this case really illustrates the point in a stark fashion. Twitter simply does not benefit my platform. Sure it is great to have 552 visitors that I would never have had, but look what it takes to get it. I also get tons of repins on Pinterest but even this viral post generated almost no referral traffic from Pinterest. Google+ is not much better. If either platform (Pinterest or Google+) benefits the AALBC.com brand I have no way to measure it. There was indeed a surge in book sales. The majority of these sales were made by people on mobile devices. if you look carefully at the Google Analytics chart, I shared above, you will see that almost 75% of the visitors (5,228 total) were Facebook mobile users (m.facebook.com). Naturally, the mobile users dominated sales. My initial posts on social media did NOT generate all of the engagement and resulting traffic; it all come from people who shared it and even more who reshared those shares. We benefit most from social media when we support each other naturally, organically. Organic reach is far more powerful than paid or promoted social media posts. I've never seen this much engagement from a promoted post. Plus, needless to say, it is a whole lot cheaper. The underlying content has to be of interest. 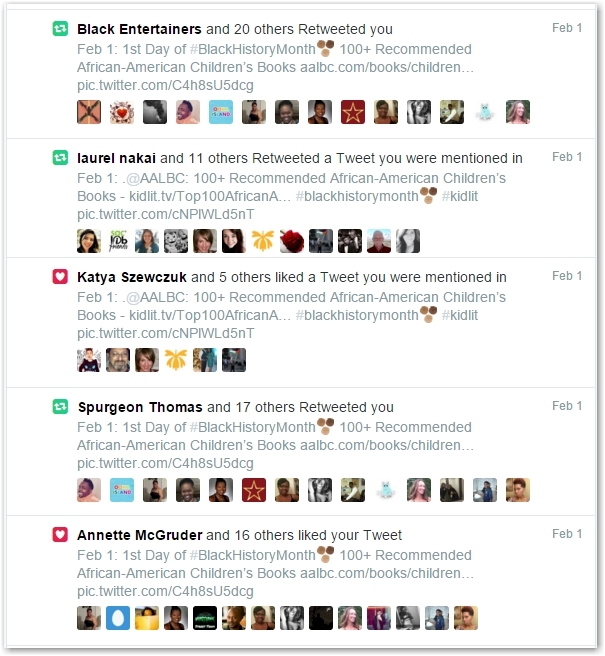 Children's Books have been in the news lately, it is Black History Month, and frankly people love lists. The new website design will allow me to go to town with lists. Yesterday I published QBR's 100 Essential Black Books, tomorrow I'll share 25 New Books by African Writers. Will any of these pages gain as much traction as the children's book list, I doubt it, but I does not need as AALBC.com is more than one page of content. It is the collection of content here that will attract visitors over the long haul. One of the reasons I'm upgrading this site it to optimize it for mobile users. I see clearly why this is so important: since the site is optimized for mobile; making the book purchase, directly on the site, is easy for the reader. As a result, this site earns more commissions on book sales. Examining your site's traffic is so important. If I never looked at my website traffic I would never have known that all of the Twitter engagement led to very little traffic and zero book sales. 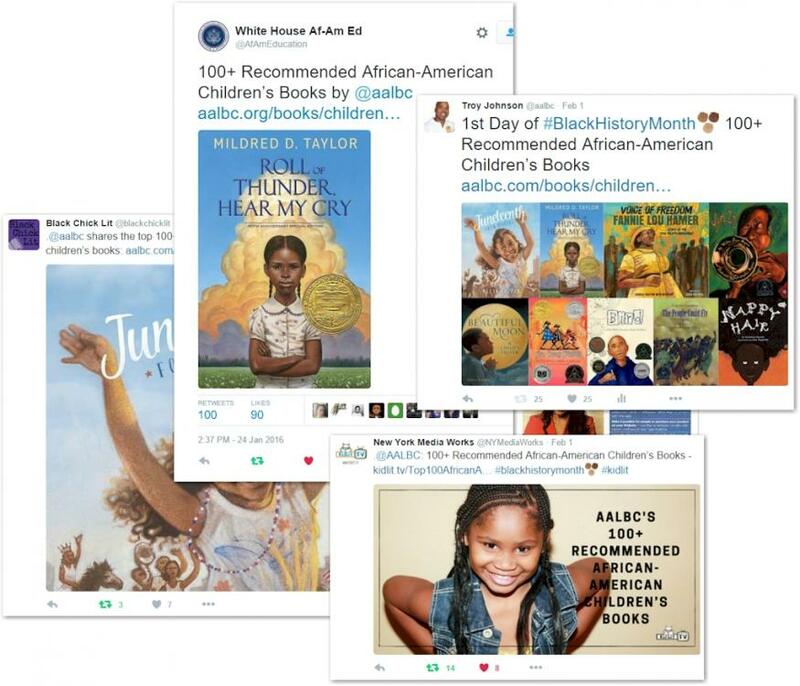 The week long half-life for the "100 Top Recommended African-American Children's Books." list is actually a lot longer than I'm accustomed to seeing. Typically a single day half life is normal. This subject has legs right now and is supports my designed to provide more content in this area. Oh and there would have been no hyperlinked text. I'm noticing that many entities are abandoning maintaining websites in favor of Facebook pages. I've also been reading about content providers agreeing to publish content for consumption directly on Facebook. If this trend continues I think it would be disastrous on more levels than I can describe now. It is hard to imagine that this is happening in an environment when running and maintaining a website has never been easier or cheaper. Another reason I upgraded my website was to move it from a server which was costing me $90 a month, to one which costs me $14.99 a month. It could run AALBC.com on a website that costs less than $30 a year--inlcuding domain name registration. There is NO reason for Facebook to be anyone's primary platform. After my 366 days of Black History campaign, I'm going to stop posting to all social media. I will support anyone that shares content on social media on AALBC.com's behalf, but I just will; not post. Social media, like this very discussion forum needs people to participate in order for it to be valuable. If I'm constantly posting there why would people come here? I just realized why you said you won't post there. By posting to Facebook directly from your account it builds a redundancy and Facebook gains preference in search for your site. By continuing to post through the AALBC site on Facebook that site gains preference in search vs your site. I would say there is a conundrum, but I know from my own experience how little traffic arrives to my site via social media outlets. The majority of my traffic is direct or search. It is more important to generate content than it is to share via social for what you do. I do think that continuing to use social sharing buttons is important because it is how other people tend to share your information. Definitely a good breakdown. I will have a new analysis for a Facebook Ad for CBP Music by next week. I'm waiting on the numbers from iTunes and Amazon mp3 and streaming, on sales for the first half of February to come in so I can do a direct comparison to the increase/decrease/no change in sales. This will be a true test since both of the artists are old cats in their 70s who aren't on social media at all. The majority of their sales and streams come from abroad. I will share it when the numbers come in. Astute observation! I think the hardest thing is not getting swept up in the "conversation" for example; I got caught up in the political implications of Justice Scalia's death allow for President Obama to make a move before he leaves office ... If I would have taken the opportunity to first blog about it then tweet from my blog...I could have capture some passers-by in my excitement. It isn't a habit I've cultivated it - but thinking about my online property as a platform first then sharing my ideas - is what I need to work on. Mel, I can't tell you how many times I've told people USE YOUR BLOG!!!!!! I see these great detailed back and forths and the only platform benefiting is Facebook. It's so damn frustrating to witness. People have come to realize now that I won't get into a lot of back and forth on Facebook. I've even shared with people how easy it is to add content to their sites using a great Wordpress feature named Press This. One of the guys that writes on CBP I taught how to use it and we can easily update the site everyday if desired. I think I will do a video on that for people because it's so basic. Big news for both of you, because you know that's how the board rolls, Disqus has now monetized their feedback system. You both need to take the time to go to the new section and submit your sites that use Disqus. It's called Discus Reveal. I submitted my sites yesterday and I'm waiting on the response, but this is good. If everyone forced the dialogue back to their monetized platforms then change begins to happen and people become a bit more empowered. I've even shared with people how easy it is to add content to their sites using a great Wordpress feature named Press This. One of the guys that writes on CBP I taught how to use it and we can easily update the site everyday if desired. I think I will do a video on that for people because it's so basic. Thank you! I'm looking forward to the video. I'm consolidating my blogs into 2 . I just set up a wordpress blog through godaddy dot com hosting. This info will come in handy. I have a disqus account too so I'm looking forward to your report on that one as well. Where is the midpoint between ATL, NYC and Memphis? We should host an conference, a real roll-up the sleeves combine to hash some of these issues out. We all know an least two who would be interested in doing this maybe we get the ball really rolling. I've been part of similar efforts that went no where, but Mel is fired up and Chris is not too jaded yet :-) I think our group we can actually make something happen. Over the long term. Maybe over the Summer? What do you think? Atlanta is 9 hours from Memphis, and NYC is 19 hours. Memphis has the worst airline rates, but I think DC is kind of a midpoint. I think a conference would be really good and the amount of info we all have is pretty doggone good. The problem with anything like this is organization. I think if AALBC decided to do something similar to Boyce Watkins Financial Bootcamp online that it would probably do pretty well. I know Paul Brunson is organizing an event in DC and I think his goal is to pull presenters together so he could possibly be someone for you to reach out to. I'm always interested in reaching more people of course. Mel I think I will work on the Press This feature video tomorrow, but the Disqus Reveal will probably be a slow process since it's a new rollout program and they are probably going to approve bigger sites first before it "trickles" down to smaller sites like mine. It is really good info though. Yeah coordination something like this would take effort. Let me see if I can get say 20 people together in a hotel in somewhere where we can connect on a personal level and hash out some ideas. I think southern VA maybe NC would be more central and definitely cheaper than NY or DC. It does not have to be a destination location. It could be like a writers retreat, the less distractions the better. I always think in terms of destinations because I always take the family with me. I do think a thinktank would be a good thing. If the coordination doesn't work, then a Hangout or Spreecast that's private would be just as vital. Anything that gets the ideas out there. Did someone say "Conference"? Did you know my perfect idea of vacation is at a conference, convention and/or seminar! One of my most "funnest" job was exhibit coordinator for Penguin USA... So here's an idea - how about first checking your events list to see if it triggers one those annual association meetings that we can piggyback. For example, @Troy have you thought about pitching a breakout session for one those established meetings or events...You can negotiate for meeting space and honorarium. Or it doesn't have to be a one-time event either but where ever we hold it, adding a hangout or youtube live will allow others to attend who couldn't make the trip. We could start out small with gotomeeting (they have a free 30-day trial) to format an agenda and then begin promotion to gauge interest. Whatever way I can assist, I will! There is an event in Charlotte I've been meaning to attend (I helped in the initial organization but never actually attended the fair. Maybe I can set something up then. That's a 4 to 5 hour drive for me or 1 hour flt time and Charlotte is lovely! It seems as though we may be looking at 7 months from now if the organizers remain consistent in scheduling. This would give us ample time to create a format and an agenda. We would also have time to invite participation. More participation means we can sell our books! woo-hoo! Sounds like a plan. I'll reach out to the organizers.